Disclaimer: this review only covers the filthy heretical version PS2 version and may not represent the alternative PC gaming experience. Also, spoilers ahead. Something that I’ve always considered important in a game is a sense of atmosphere. Although I can’t define it exactly, I’d say that music, graphics and background information (that is, information presented to the player that isn’t directly part of the ongoing narrative – for example, NPC dialogue or ‘bestiaries’ à la Final Fantasy XII) contribute to a good sense of atmosphere. Although gameplay is also important, I feel that good atmosphere can make up for mediocre gameplay (thus why I’m still slugging through Drakengard despite the horrendous gameplay mechanics). Deus Ex has both of these qualities in significant amounts. As far as atmosphere is concerned, Deus Ex does exceedingly well despite being somewhat dated. Although the music is rather subdued and not particularly memorable (aside from the lovely orchestral opening theme), it does what’s needed: it sets the mood of intrigue and conspiracy perfectly. If anything, a more emotional soundtrack would clash with the cyberpunk setting. What the game particularly excels in is background information. 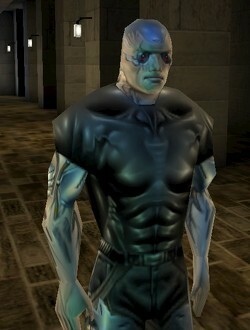 Books, computer terminals and ‘datacubes’ (which seem to act as rather pointlessly hi-tech post-it-notes) are commonly found around the gameworld and while some reveal necessary information for storyline progression, the majority are simply fluff. However, this fluff is what really makes the world of Deus Ex: backstory to the major characters, details about the setting and poignant sidestories. For example, in the final level we find a datacube next to the body of a soldier who stood his ground against invading troopers. There are other bodies like this one scattered around the level, but we get to learn about his individual fate. The great thing about all this fluff is that it’s completely optional: the storyline progresses fine without the player knowing any of it. It really rewards exploration without making it tedious. The only downside is that the fluff becomes rarer towards the later sections of the game, but there’s more than enough of the main plot at this stage anyway. It’s through little details like this that we get a constant apocalyptic feeling, especially in the decaying urban settings where most NPCs are drunk, dying or murderous. Various conspiracy theories are weaved together effortlessly – Area 51 exists side-by-side with the Illuminati and an illness not too dissimilar from AIDS covertly spread by the government. It’s almost like a Super Robot Wars game for crackpots. Furthermore, although it’s obviously not on the same level as, say, Orwell or Huxley, Deus Ex is a lot more intellectual than your average shooter; there’s a genuinely political feel to it in places beyond simple violence. Gameplay is another strong area. While it’s by no means a stealth game, Deus Ex does encourage discretion and careful planning. It’s often easier to pick off enemies one by one or find alternative ways of killing them rather than a full-on firefight. Rushing through stages with a machine-gun is possible, especially towards the endgame with judicious use of certain upgrades (the self-healing augmentation is pretty broken), but it’s trickier and ultimately not as fun. Item management is key, considering that there are few places to restock and most of your weapons and usable items must be looted from enemies or found as treasure – something which I felt paralleled the spirit of the RPG genre nicely. The upgrades system has a good in-game justification in the form of nanomachines (Deus Ex doesn’t really believe in gameplay and storyline segregation) but can be somewhat gamebreaking when levelled-up enough (the aforementioned self-healing and cloaking augs particularly). The elements of choice within the gameplay are substantial. You can choose to bypass a lot of the fighting by going through side paths and most bosses can be killed earlier than usual. The downside to all this choice is that not very much is permanent – and the different routes through a level can provide such lucrative benefits that you’ll end up exploring all the alternatives simply to pick up upgrades and such; thus defeating the purpose of branching pathways. So, while you might choose to enter a base stealthily, you’ll end up killing everyone in order to find the secret stash of grenades. Furthermore, the three alternative endings pose a genuine moral problem for the player. None of them are particularly appealing and your decision really comes down to ethics. Would you prefer people to have to suffer for freedom or be happy under a benevolent dictator? Of course, your decision might also be influenced by simplicity – one of the three endings is rather easier to acquire than the other two. 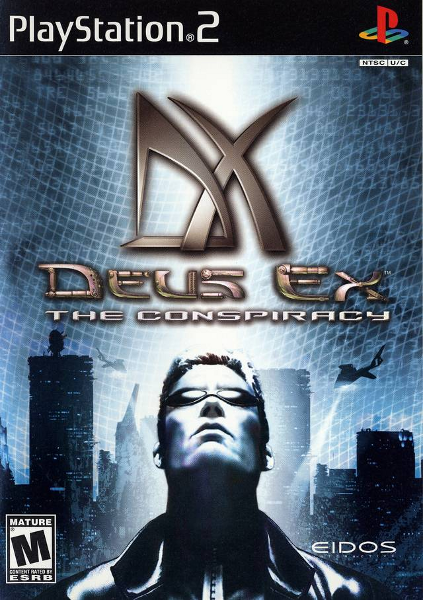 Also, rather than the traditional method of having the ending dictated by your actions throughout the game (and therefore you’re screwed if you did accidentally did something which prevents you from getting your preferred ending), Deus Ex pretty much explicitly presents your three options at the start of the final level and explains what you have to do to get them. However, one area in which Deus Ex falls flat is its graphics. Given that the PS2 version is eight years old and the PC version even older, it’s understandable; but nevertheless, the monotonous backgrounds, lack of detail and repeated models are quite jarring. Sea-based levels are especially bad, as the water just seems to end in midair once you reach the edge of the map. Even the ending FMVs are pretty awful. There are also issues with pacing. Because there are no proper cutscenes (the camera pans away for conversations between the player and NPCs), events can happen rather suddenly and unexpectedly. Boss battles in particular are affected; your opponent will somewhat randomly appear, give a line or two of dialogue and then start shooting. Even after you kill them, nothing really happens immediately. It can be quite confusing at times. Some aspects of the storyline could use more development: for example, ‘grey‘-style aliens are found in several levels and little explanation is given for them aside from a little background which seems to suggest that they are fake. Also, the comedy accents are just inexcusable. The French, German and Chinese characters wouldn’t be out of place on a Saturday morning cartoon series. Regardless of its faults I’d say that Deus Ex has aged brilliantly and deserves the critical acclaim which it rightly gets. I feel bad for paying £2 for a second-hand copy. Like I said before, I played the console version; the PC version is probably better given that it’s a format more suited to shooters (also, the PC version apparently doesn’t have the cumbersome loading times which mar the PS2 version). But I’d guess that what makes it great on the Playstation applies equally well on the computer. This entry was posted in Games, Review and tagged atmosphere, cyberpunk, deus ex, ethnic stereotypes, FPS, playstation 2, review, the conspiracy. Bookmark the permalink.